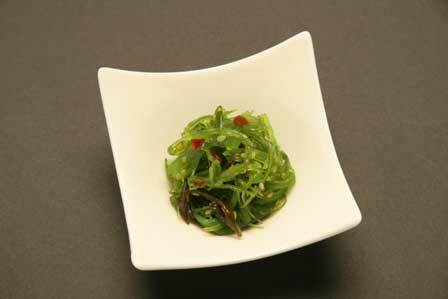 Sesame seaweed salad is a combination of wakame seaweed, vegetables, and spices. The vegetables are primarily sesame seed and red pepper. There is a large component of sesame oil as well. The wakame seaweed itself is harvested in Japan, but the finished product is processed here in the United States. Wakame seaweed is light green in color, and is crunchy, but not very firm in texture. As it’s name implies, there is a strong sesame element to the flavor of the salad.